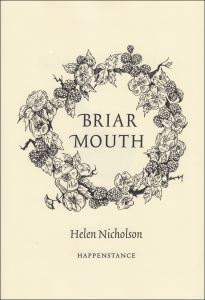 Briar Mouth is the first published collection of poems by Helen Nicholson. She has had poems published in Gutter, and Magma magazines and shortlisted in the Bridport Creative Writing Competition, 2015. She lived near Fort William as a child, spending time in Skye, and now lives in Fife. These locations are clearly reflected in her poetic interests, from the West in ‘A Family History’, to the chill of East coast sea mist in ‘Haars and Sea Frets’. I had thought that ‘Briar Mouth’, the title poem of the collection, would be a nature poem given the garland of fruit and flowers on the front cover. It isn’t. It’s much more. It offers a powerful reflection on communication. There is a thoughtful scattering of broken words on the page, which, when read aloud conveys viscerally the halting speech of someone with a stammer. In her ‘Elegy to John Nicholson’, words have been chosen from a Gaelic dictionary to suggest the girth of a man’s life. Each section sits as a short meditation, complete in itself. Together they build a powerful lament towards the climax of the ‘huge receding wave’. Setting that life within its natural Gaelic speaking community, linking it to the earth and nature, and imbuing it with love makes this poem very moving. Here is a poet for whom the adage ‘less is more’ was invented. And his span? Too short. proud in the front row. ‘Advice to Students of “Gaelic Cultural Studies’ is subtle in its appeal against romanticising a bygone age of Gaelic speaking communities. ‘My Bonnie Prince’ gives us a story of The Young Pretender with a twist. I hope it’s true. It’s funny. This first collection of Helen Nicholson’s poems is a garland of delights, gather it up, it has fruits aplenty.